After 90-plus days at Freedom Project I feel very invigorated. Though I have met some of you already in person, I’d like to introduce myself again in this newsletter. Recently I completed the unit “Who am I?” in a Mindfulness Meditation curriculum, an online course a dozen staff and volunteers are currently taking. There are so many answers to this who-am-I question, but here are a few facts. I was born and raised in Montana, and the Big Sky country holds a special place in my heart. Over the course of my professional life, I have worked exclusively with nonprofit organizations. I have taught courses leading to GED certification for prisoners in jails. I have lobbied for peace and justice in the “other” Washington, and I have worked with people infected by HIV/AIDS. As a result of an outreach program for Native American tribes in Billings, Montana, I was adopted by the Crow Nation. I ministered as a hospital chaplain; and most recently, I was the executive director of transitional housing for homeless women in Seattle. I realize that I have lived an incredibly rich life. And now I get to walk with women and men in prison, alongside generous volunteers who bring their own amazing backgrounds to the task. No wonder I feel so invigorated. Thanks to my steadfast predecessors, I join Freedom Project at a time of growth in resources and talent. I can rely on a very engaged board of directors. This year’s Give Big campaign doubled last year’s contributions. Our experienced staff collects data that documents our effectiveness and helps recruit volunteers. Our training programs attract professionals and volunteers in increasing numbers. Our newsletter reaches a widening circle of friends and supporters. Best of all, more administrators appreciate our work and invite us to offer NVC courses at additional prisons. 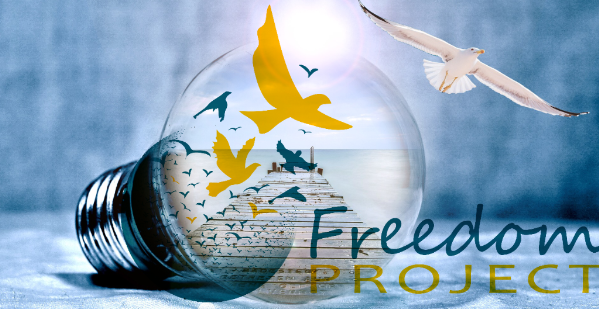 I feel inspired by Freedom Project’s golden opportunities of transforming prisoners into peacemakers. I hope my sense of commitment will be contagious and engage you even more. I thank you!